Trade Safely. Use our anti-scam guide to protect yourself. Report this ad as inappropriate. 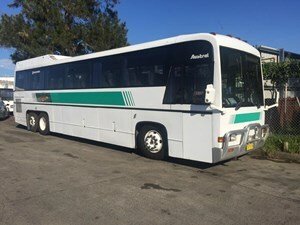 reconditioned GM 6V92 rear mount diesel engine, 6 speed Spicer manual gearbox, full air suspension, power steering, full air brakes, maxi brake, engine brake, tubeless wheels, alloy bulbar, modernized Austral Tourmaster one door coach body, 40 feet length, airconditioned, 48 cloth recliner coach seats, luggage racks, curtains, tinted bonded windows, rear toilet, sunken aisle, huge underfloor thru bins.